I have another challenge card to share today. On Wednesday I stopped at Creative Belli Blog and Belli Challenge #69 is a create a card with texture. 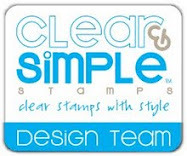 I pulled out my cuttlebug and a variety of embossing folders and got to work. The base is SU soft sky with a mat of purely pomegranate and K & Company Wild Raspberry dp. Next I used the scallop label punch from SU to punch four pieces and then ran each one through my cuttlebug with a different embossing folder. 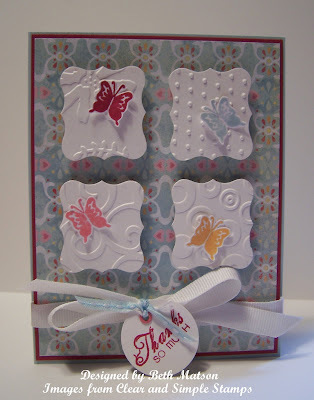 I mounted the scalloped labels with pop dots for some dimension and then added a butterfly to each one. The butterflies were stamped with SU purely pomegranate, soft sky, marigold morning and positively pink and then cut out. The butterfly is from the set along with the sentiment. Before adding the sentiment I tied a bow around the card. The sentiment was stamped with purely pomegranate ink and punched out with a circle punch. I used my crop-o-dile to add an eyelet for threading the ribbon through to attach it to the bow on the card. Thanks so much for stopping by. Happy Friday! I hope you all have a wonderful weekend. Great card, Beth! I just saw another card this morning with a textured shape - I thought it was such a cool idea! This card is great, Beth! Love how you used a different folder for each of your labels - very clever! Love your little butterflies, too! Your card is fabulous, Beth. Love the different cb folders that you used. Thanks so much for playing with us over at the Belli Challenge Blog. WOW I love your texture... Very pretty... Thanks for playing with us in the Belli Challenge.. This is gorgeous Beth! Love how you textured up your backgrounds!!! Thanks for playing in the Belli Challenge! Simply Beautiful! Thanks for playing with us Belli Girls! This is fabulous! I love the different textures, you've pulled it all together perfectly! Thanks for playing in the Belli Challenge! What a great design...love how you used all the different cb folders!!!! Thanks for joining us in the Belli challenge!!!! Thanks for playing the Belli! I love all the different folders and those yummy little butterflies! !